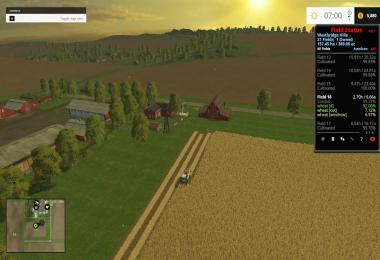 This is Field Status, version 15.2, for FS15. It's a Lua script that will display the status of all fields on your map. It will show what percentage of each field is plowed, cultivated, seeded, and/or fertilized. For each crop planted, it will display the percentage of the field covered, and the crop's growth state, cut/windrow, and withering. Bales that are on fields will also be shown. Also displayed are the map name, number of fields, and the hectares and acres for each field, along with the total for the map. Fixed problem with "Can't find pda_map.dds" error. Changed this to be a warning, not an error that will keep Field Status from running. Also, enhanced code that determines where the pda_map file is. Added map file's computed hashcode to the filename for "Fixed" xml files. This will help make a mapname more unique for those situations where different versions of a map have the same filename and version. 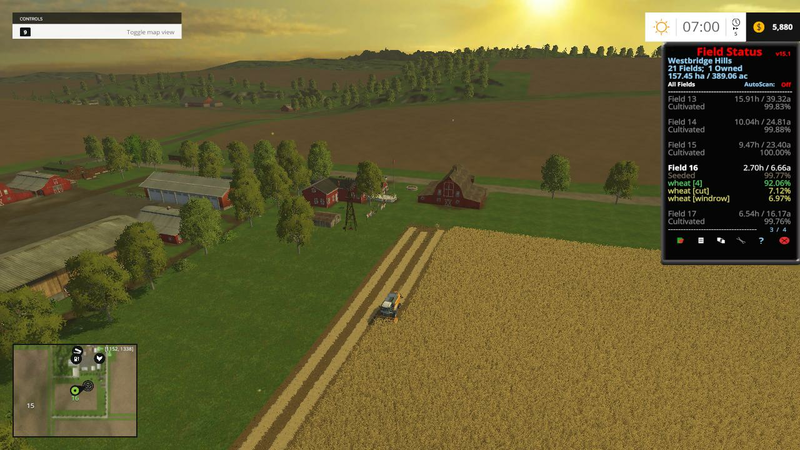 IMPORTANT: This version of Field Status will work ONLY for FS15 maps. It has been tested on Patch Level 1.2.0.0 1.2 RC6. Other than converting it for FS15, the major change in this version is the new system I created for reading the field definitions and creating the coordinates to scan with. I wanted to do this so that Field Status would be able to read any new map that is released without any manual intervention. Having said that, I did come across some maps that require "fixed" xml files, and I will be releasing these at the same time as Field Status. Please be aware that there are some maps that I could not create fixed files for. These include maps which have either one or zero fields defined, maps that have primarily grass fields, and maps that are mainly used for logging. There is a new feature called "Growth Threshold." It is basically a config-file option to prevent showing certain crops on a field if they are below a certain percentage. Details on how to use this feature can be found in the README.txt file. There were also the usual various minor changes that occur with a new version. The HUD appearance was changed a bit, and you can now click/double-click on page numbers to scroll through screens, in addition to using the NUMPAD keys. I have changed the type of copyright license for this version. Please take note of this. the README.txt file. It contains information that should answer any questions you may have when using this mod. when starting a new savegame, the Field Initialization process will take several seconds. The message line at the bottom of the Field Status HUD will show the progress. See the license.txt file for copyright information. Simple and easy: COPY "fieldStatus.zip" to your mods directory. Kobe8 helped me in early testing of 6.1 with a few maps. I want to extend a HUGE thank you to rwy22sp (Mike) and modelbuilder47 (Ken), for extensive testing in MP. They put up with many iterations of my buggy code and trial and error while I was trying to get the code working that sends the bale information to the clients. A special thank you to Decker_MMIV, who has provided me with technical information, tips, and ideas from the very beginning. Thanks for all your help. Jakob Tischler, Courseplay author, has also provided me with technical knowledge and tips. HUD: grimber, with changes by me. As always, the fs-uk.com forums and Giants' documentation were of great help. Hey Thomas, I have downloaded several of your mods, but this one isn't working on my map. I am on the Westbridge Hills map and have restarted my game several times and have played for over an hour and it never displays my field status.